Orders are usually dispatched within 7 working days of receipt. Please contact me if an order is urgent and I will be able to confirm a delivery date. Orders through my website shop can be paid for by card or PayPal. All UK orders are sent postage free in a glossy white cardboard gift box with 'Sarah Packington' logo including a care information card. Non UK orders are £4 shipping. 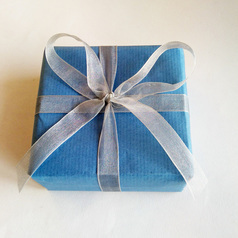 ​I am happy to gift wrap items and add a card on request for no extra charge. Please request this in the 'comments' section when you order. I hope you will be delighted with your new jewellery. If for any reason you wish to return your order, please do so within 30 days of receipt, unworn, in the original packaging at your expense for a full refund or exchange. Necklaces on a nylon covered stainless steel necklet can be made any length to suit you. Silver omega necklets can be 16 or 18 inches. All pierced ear wires and backs are sterling silver. Clip earring fitting are silver plated. To keep your jewellery looking its best, avoid bringing into contact with body lotion, hairspray and perfume etc. As with most dyes, prolonged exposure to sunlight can cause fading, but my pieces will retain their colour with normal wear. I recommend storing pieces in their boxes away from sunlight. Clean using a silver cleaning cloth such as Goddard's. Acrylic pieces can be cleaned with a damp soft cloth and a little detergent. Sarah Packington white glossy card jewellery boxes with optional gift wrapping. The acrylic sheet I use is made from up to 25% recycled material. All off cuts are recycled or re used. All my waste silver is recycled. I use Disperse powdered dyes which are non toxic and are also supplied to schools for educational use. My card boxes are currently made from 78% recycled material. All boxes and packaging from materials that I use are re used or re cycled where possible. Sign up using the form on the Home page to receive occasional emails about upcoming exhibitions and special offers. You can unsubscribe at any time. I will never share your email address with anyone else.